2 What is TPCASTT? 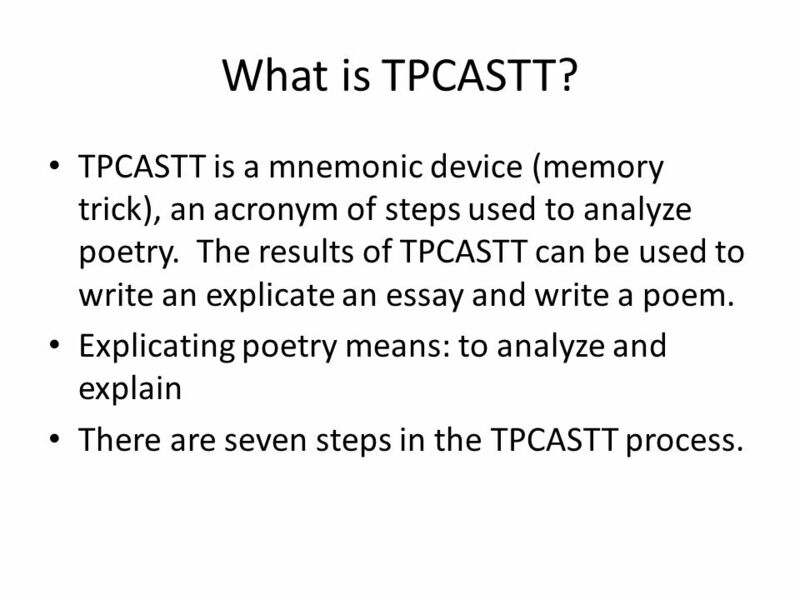 TPCASTT is a mnemonic device (memory trick), an acronym of steps used to analyze poetry. The results of TPCASTT can be used to write an explicate an essay and write a poem. 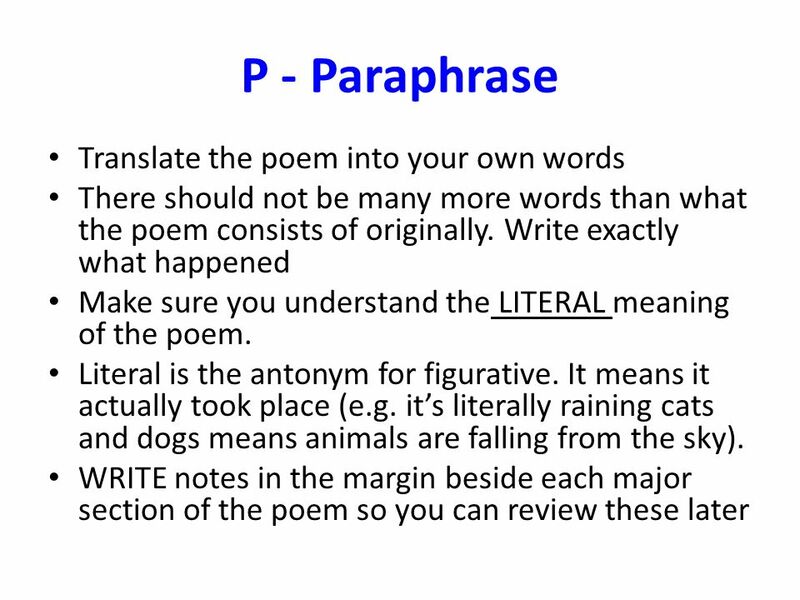 Explicating poetry means: to analyze and explain There are seven steps in the TPCASTT process. Look at the title and attempt to predict what the poem will be about. Using the sample in front of you, let’s do this step now. 4 STOP! Put your pen down! Read the poem all the way through without marking it. Read it for understanding Look up any words you are unfamiliar with and define them. 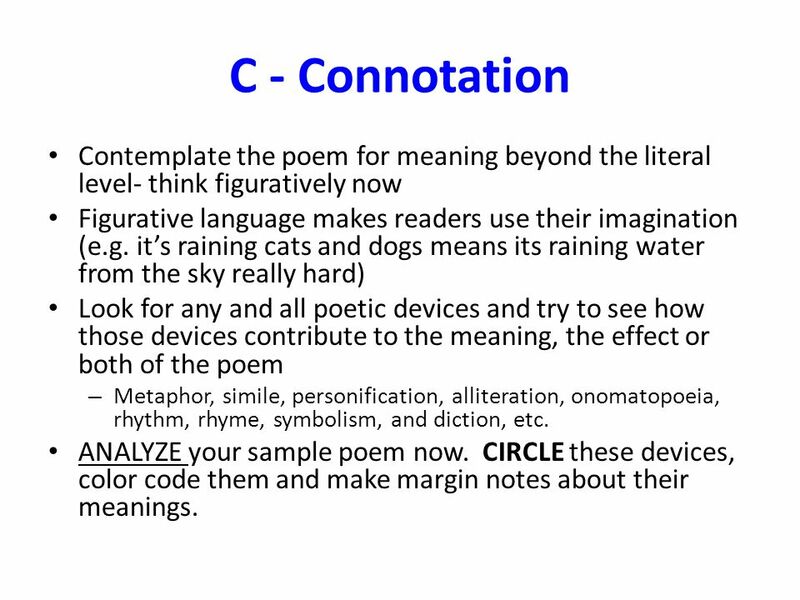 6 C - Connotation Contemplate the poem for meaning beyond the literal level- think figuratively now Figurative language makes readers use their imagination (e.g. it’s raining cats and dogs means its raining water from the sky really hard) Look for any and all poetic devices and try to see how those devices contribute to the meaning, the effect or both of the poem Metaphor, simile, personification, alliteration, onomatopoeia, rhythm, rhyme, symbolism, and diction, etc. 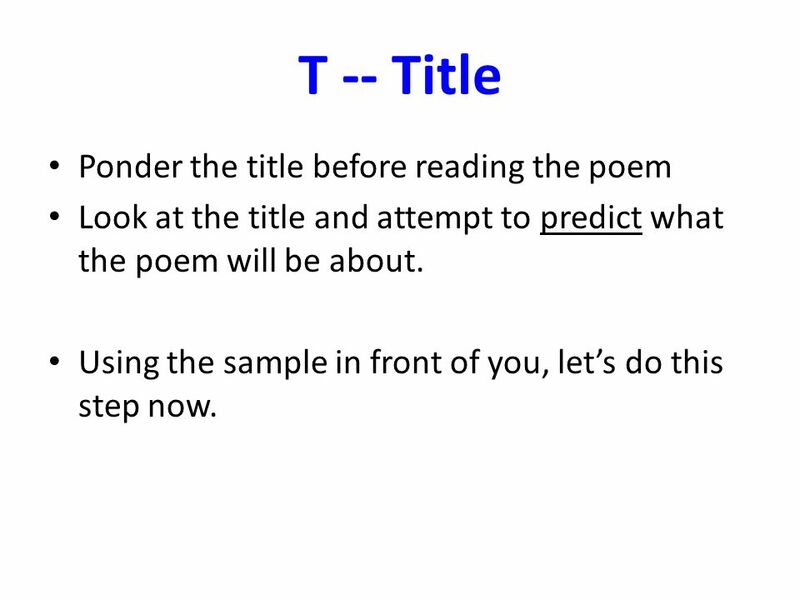 ANALYZE your sample poem now. CIRCLE these devices, color code them and make margin notes about their meanings. 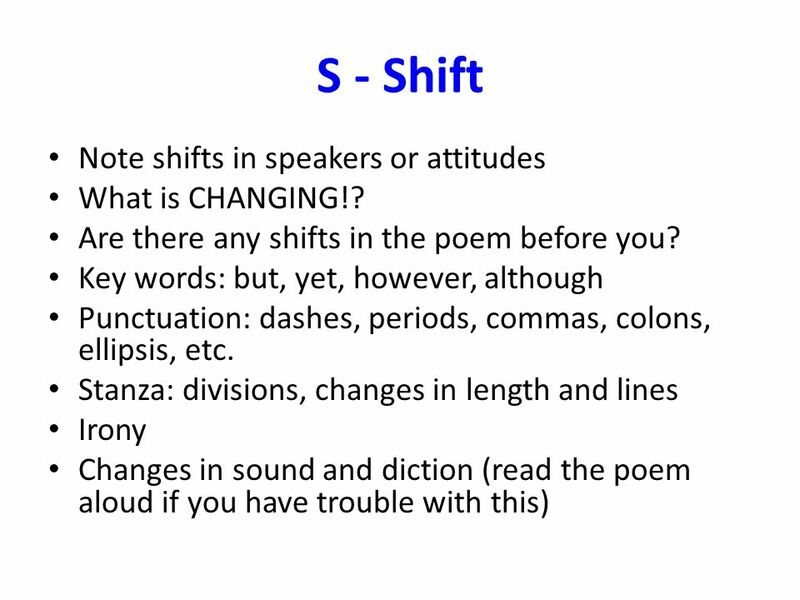 8 S - Shift Note shifts in speakers or attitudes What is CHANGING!? 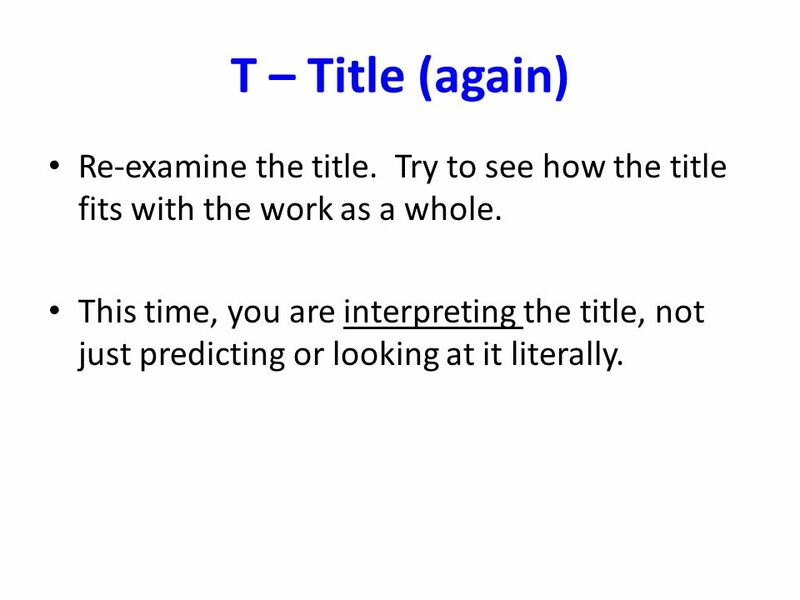 9 T – Title (again) Re-examine the title. Try to see how the title fits with the work as a whole. This time, you are interpreting the title, not just predicting or looking at it literally. 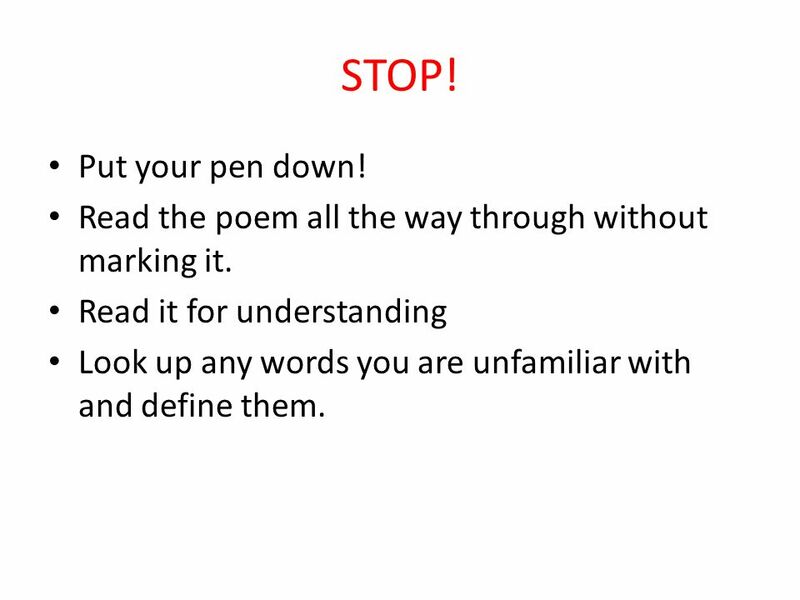 THIS IS NOT THE MORAL OF THE POEM Identify the theme by recognizing the human experience, motivation, or condition of the poem. Follow the steps on your handout to help you come to theme. One work may have several possible themes Ask yourself why is there only 1 poem that 100 people can connect to… What is that reason they can connect with it? 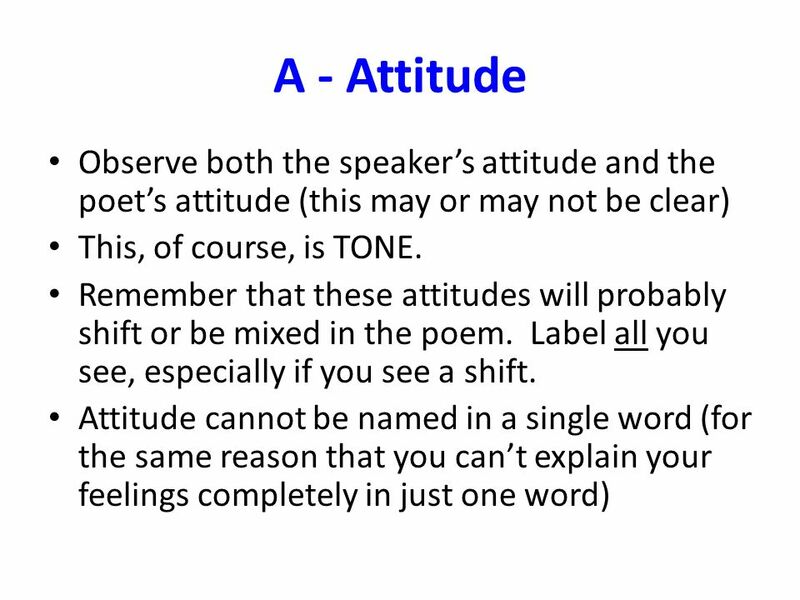 Download ppt "TPCASTT Notes on Poetry Analysis Technique"
The Art of Annotation Annotation is the ability to draw out key points of a text for future reference. We only retain 10% percent of what we read. Annotation. TPFASTT T itle P araphrase F igurative Language A ttitude S hifts T itle T heme. 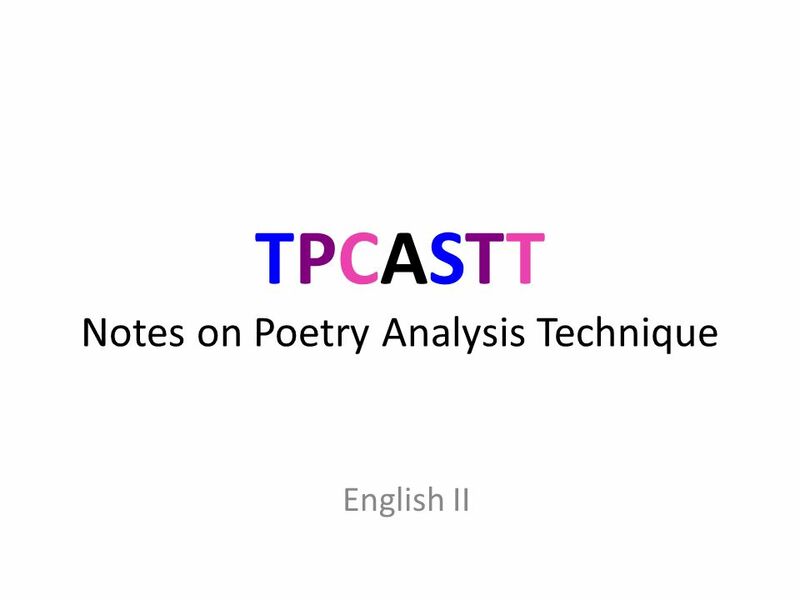 TP-CASTT Analysis How to Analyze Poetry. 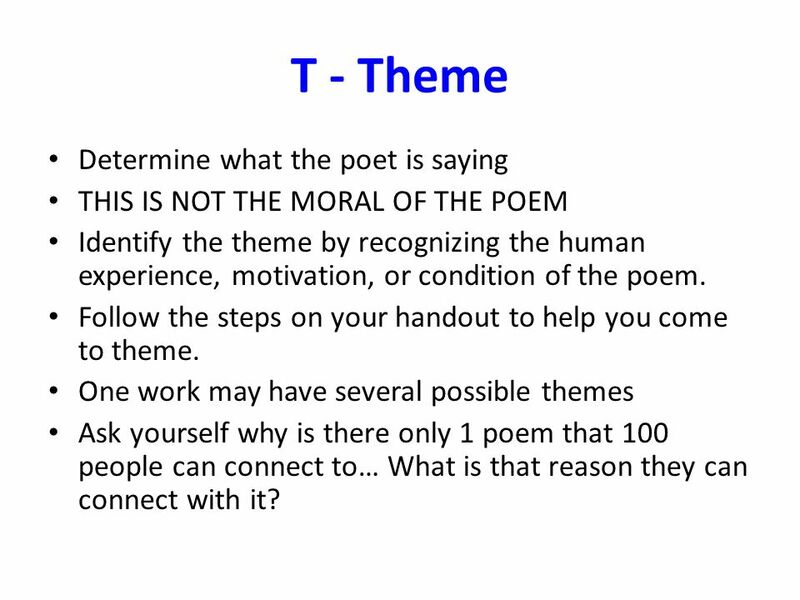 TPCASTT LESSON SWBAT APPLY THE TPCASTT STRATEGY IN ANALYZING A POEM. FEBRUARY 4, 2013 MS. ROULE HAPPY NEW SEMESTER! English 3. Opening: KWL-All About Poe On a sheet a paper, draw a three-columned chart. Label the first column with a “K,” the second column with a “W,” and the third. TP-CASTT Poetry Analysis Understanding meaning and how technique enhances meaning. P OETRY A NALYSIS. Select the poem carefully In a poem analysis, you will generally be given a selection of two or three poems Pick one to analyze Pick.